HomeCinemaMasalaParis Paris: Kajal Aggarwal Uncannily resembles Kangana Ranaut in the Tamil remake of Queen! 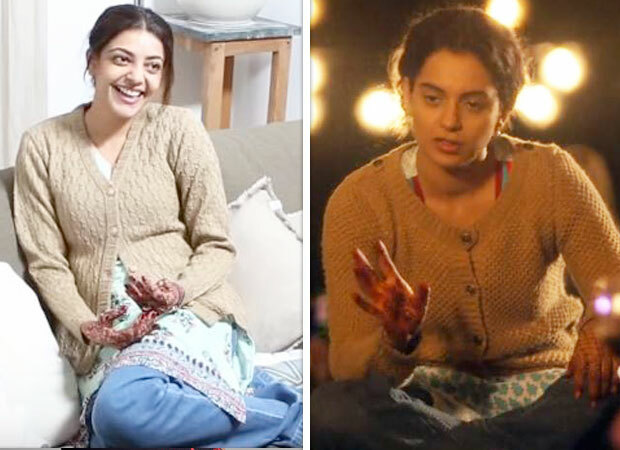 Paris Paris: Kajal Aggarwal Uncannily resembles Kangana Ranaut in the Tamil remake of Queen! It is a known fact that when Queen hit the theatres, the film went on to become a sleeper hit. Furthermore, it also had Kangana Ranaut garnering accolades and appreciation for her performance, albeit in a deglam role. And now planning to repeat the success story, the South filmmakers have decided to make the film in four languages. While the details of the same were earlier reported, now, we got a glimpse of the schedule of the Tamil remake titled Paris Paris featuring Kajal Aggarwal. We recently got glimpses of her avatar as the deglam girl essayed by the Magadheera actress. On the occasion of her birthday, the makers of Paris Paris decided to release a Behind The Scenes video featuring Kajal Aggarwal shooting for the film. She is seen shooting for the scenes on the streets of Paris, France. And the role of Lisa Haydon is played by Elli Avram in the Tamil remake. Besides the two actresses, the director of the film Ramesh Aravind is seen giving instructions to the star cast about the scene. Interestingly, Ramesh is also directing the Kannada version of the film. Also Read: REVEALED: Tamannaah Bhatia starrer Queen remake now gets a NEW director!